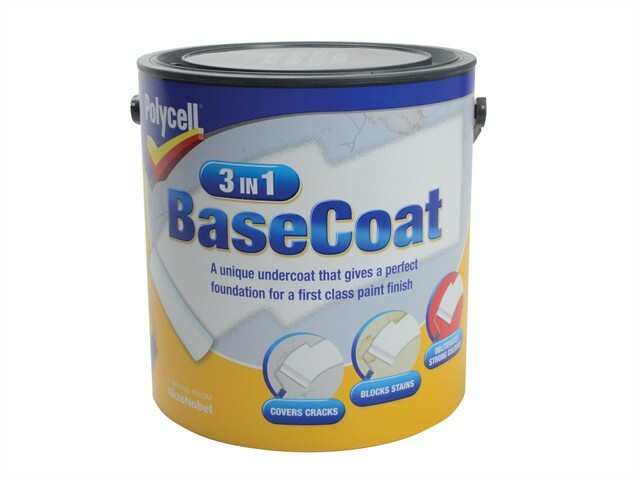 Polycell 3-in-1 Basecoat is a unique undercoat for walls, which completely covers all common wall imperfections in one, easily applied coat. Containing Polyfilla Technology, the 3-in-1 formulation not only covers hairline cracks, stains, patchiness and strong colours, but also permanently stops them from reappearing - providing the perfect foundation before painting. It is easily applied with a roller, straight from the tub. Suitable for indoor use on plaster, plasterboard and painted masonry surfaces.